Sun Life Board Members and other officials officially cut the ribbon opening Sun Life’s new building in Oracle. 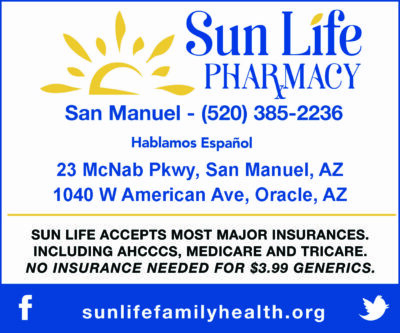 The Oracle Sun Life Family Health Center sponsored a Health Fair and Open House on Saturday, Jan. 19, 2019. 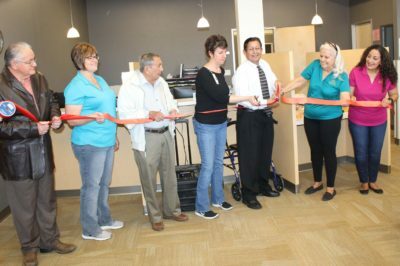 The Open House and Health Fair offered guided tours of their new building located at 1040 W. American Ave. It was a good opportunity to meet the staff, find out their available services and learn about available community services. Food was catered by Mi Pueblito and health care and service agencies provided many giveaways. The health care providers and service agencies included: United Way of Pinal County, Child & Family Resources, Arizona Complete Health, Hearing Centers of Arizona, Apache Junction Public Library Fun Van, Pinal-Gila Council for Senior Citizens, Steward Health Care Service Health Choice, and Sun Life. Free blood pressure checks and hearing tests were available. Some Sun Life Board of Directors attended as did CEO Travis Robinette, Director of Community Outreach Renee Louzon-Benn and Oracle – San Manuel Practice Manager Al Gutierrez. Tri-Community Board members are Ellie Brown, Marie Roybal and Manny Chavez. Former Board member Henry Velasquez was also in attendance.